The Sitges Carnival (Carnaval Sitges) sees the Spanish coastal town brought to life with carnival fever as parties and parades take over the streets in the run-up to Lent. While the event is celebrated throughout Spain, Sitges has built up a reputation as the place to be, thanks to the city knowing exactly how to throw a week-long party. Situated on the Catalonian coast, southwest of Barcelona, Sitges is one of the gay capitals of Europe. Each year, the carnival attracts more than 250,000 festival-goers keen to catch the energetic parades, pumping parties and drag procession featuring top talent from across Europe. Here’s a run-down of the main events, but expect the town’s many clubs, bars and venues to be hosting a packed carnival bill of their own. The carnival’s dates vary each year but carnival always kicks-off on Fat Thursday. 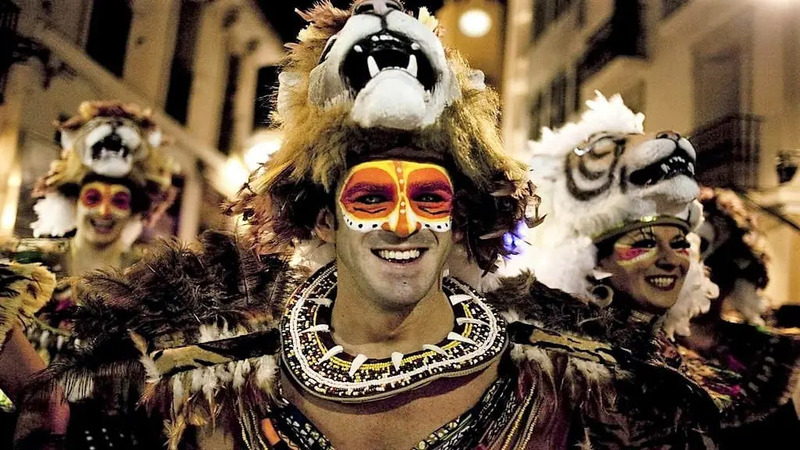 Signalling the start of a week of fun, this tradition features the arrival of King Carnestoltes – the King of the Carnival – and is a flamboyant flurry of colour, costumes and carnage. This is the Debauchery Parade and in testament to its title, features parades of risqué floats carrying a daring bunch of participants. A true feast for the eyes. The Extermination Parade officially marks the end of celebrations. Seen as a mourning, drag queens dress in black to wave goodbye to another year of parties and mourn the death of the King of the Carnival. The Burial of the Sardine ritual sees a large effigy of the fish carried to the beach and burned. This symbolises the start of Lent. The beach is dotted with barbecues and parties full of people indulging before 40 days of abstinence. The religious holiday of the Carnival is celebrated across the globe and Sitges has been marking the occasion with flamboyance for more than a century. Seen as the last chance to let loose before Lent, its debauchery is attracting an increasing number of visitors wanting to join in the fun. The 2019 Carnival is from February 28 to March 6. If you are looking for accommodation during the Sitges Carnival, please visit our Hotel Booking Portal.